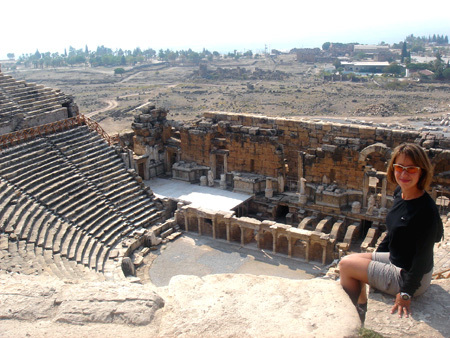 One of the visas we had applied for in Istanbul would take a few days to arrive, so we decided to fill the time with a quick visit down to West Turkey to see two amazing sights: Pamukkale, a natural formation of white limestone cliffs, and the nearby Ephesos, the extremely well preserved ruins of an ancient pre-Roman city. Our night bus deposited us in Selcuk after a 10 hour journey, and dull-eyed and floppy-tailed we were then transported to Pamukkale, another 3 hours away. 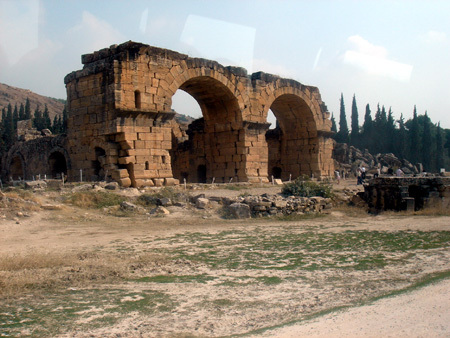 We first looked at an ancient city called Hierapolis, very impressive and well spread, though not quite as well preserved as Ephesos. 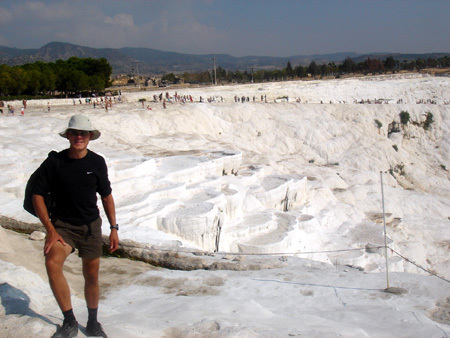 Afterwards we took a walk on the white cliffs known as Pamukkale, created by lime deposits from thermal waters. The name Pamukkale literally means ‘cotton castle’ in Turkish as the cliffs look like a big white castle from a distance in the valley. We completed our visit by taking a swim in the antique Roman baths amongst ancient pillars where Cleopatra is rumoured to have swum on her honeymoon with Mark Antony. 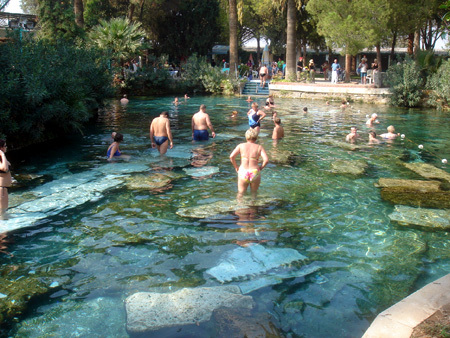 The local legend about the healing thermal waters went that an ugly woman who couldn’t find a suitor decided to end her days by jumping off the cliffs, and fell into the pool below. Miraculously it turned her into a beautiful woman and coincidentally a prince who happened to be passing by saw her and instantly fell in love with her. Lovely as this story was, it didn’t quite explain why the local women clearly hadn’t taken advantage of the waters themselves! !